← Lager GURS 1940: Blaupause für „ANKER“-Zentren 2018 ? 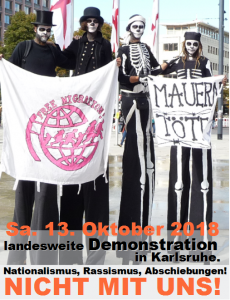 Join the regional demonstration on 13 October 2018 in Karlsruhe -Against nationalist and racist hate speech! Stop the race towards exclusion and deprivation of rights! Equal rights and a good life for all! On 26 May 1993, the original right of asylum was actually abolished. The German Parliament, with the majority of the CDU/CSU, SPD and FDP, stamped out the right of asylum (article 16 of the Law/Grundgesetz), which had come into existence based on historical experience. It was a basic law, which politically persecuted persons could invoke. Complete demolition of the law ensued: those who entered via a so-called safe third-country could no longer invoke the right of asylum. Refugees were being categorized. 25 years later, the European Union wants to systematically prevent access to the right of asylum and migration in Europe. The intention is to send back those asking for asylum at the EU borders, without due process to examine the reasons for their flight; to shift refugee protection to allegedly ‘safe’ third-countries outside the European Union; and to return persons entering from such a state. Serious human rights violations such as e.g. in Libya, are already now being tolerated and hidden from the public. The plan is to brush aside the question of how refugees eke out an existence in the third-country and to guarantee neither the right to legal accommodation, nor to family reunification, nor to access to the labour market. The intention is to isolate people seeking protection by putting them in camps. Whether in a “hotspot” at the outer borders of the EU or in an “AnKER” in Germany (Ankunfts-, Entscheidungs- und Rückführungszentrum / arrival, decision and deportation centre), refugees/migrants will lose their personal freedom. There will be no access to a fair asylum process, legal advice and effective legal protection in detention and mass camps. The reality of today’s migration policies corresponds to the programme of the extreme right. Why do we demonstrate in Karlsruhe? Our protest is aimed at the regional Government and its administration, especially the Regierungspräsidium Karlsruhe, the central foreigner and deportation authority in Baden-Württtemberg. Over the years, their policies have reduced the rights of migrants and refugees to a large extent. On 15 September 1980, the regional CSU government of Baden-Württemberg established the first mass camps in Germany and, for the first time, issued working prohibitions, limited the freedom of movement, reduced financial benefits, handed out benefits in kind and introduced a residence obligation. For the former CSU-Chief Minister Lothar Späth, the “asylum seeker mass camps” aimed at “scaring off” asylum seekers. Then and now we reject the exclusion and discrimination of people in mass camps. It all started in the first ‘Zentrale Anlaufstelle für Flüchtlinge’ (ZASt) (Central port of call for refugees) in Karlsruhe. The Regierungspräsidium (RP) Karlsruhe, which was in charge, turned it into their experimentation field. Under the administrative direction of the RP, measures for scaring off asylum seekers were put into practice and later used country-wide. It was also in Karlsruhe that the accelerated asylum process was developed in “Bezirksstellen für Asyl”/District Offices for Asylum. They are today’s models for the planned AnKER centres and the regional reception camps (LEA). Since 2008, the RP has been the central deportation authority in Baden-Württemberg. It organises e.g. the deportation flights, orders police operations for the enforcement of deportation measures and for people’s enforced appearance in embassies for the provision of “deportation documents”. Between July 2014 and May 2018, more than 2,000 children under 14 years of age, and during the past three years, 6,674 people from financially secure situations, some of whom had been living in the country for many years, were deported from Baden-Airpark. In January 2018, a family was deported after having lived for 25 years in Wolfschlugen, and, in May 2018, a mother was deported after 27 years in Schömberg. The RP decides whether medical certificates regarding travel capability are acceptable. Even people with serious illnesses (tumors, leucemia, etc) are affected. The RP is responsible for deportation detention. It also deports to Afghanistan. The authority exerts different kinds of pressure on the refugees to participate in their own deportation. Those who do not participate are punished with working prohibitions, residential restrictions and the reduction of benefits. The Regierungspräsidium Karlsruhe is the invisible authority behind the visible enforcers of these measures, like e.g. the Ausländerbehörde / Foreigner authority and the Police. The deportation machinery is degrading and inhuman. Since the decisions of the regional Government almost 40 years ago, refugee rights have been massively cut back. This was due to the exclusionary and discriminatory policy of mass camps, which have been mainly serving the deportation policies. The new reception camps (LEA) in Freiburg, Sigmaringen, Ellwangen, Giengen, Tübingen, Karlsruhe, the registration centre in Mannheim and the deportation prison in Pforzheim, continue this kind of policy. Human rights organisations have always criticized this kind of camp and deportation detention policy. Refugees in the camps have protested in various ways against the repressive system and the deportations. Mass camps, especially regional mass camps and deportation prisons must be closed. We demand the immediate abolition of the “Dublin regime” and of the system of allegedly “safe” third-countries and countries of origin! Almost every week government circles come up with new proposals for an even more effective ‘defence’ against refugees and for increased migration control. At the moment the state demands a militarisation of the border regime. This aims at eliminating any possibility for people to find work, protection, and a better life through migration. The rich countries of the “North” take up a position of all-round defence. Those who want to escape misery, poverty, the destruction of war and climatic catastrophes are supposed to be kept away or kept in their countries of origin. Under capitalist economic considerations of usefulness, only selected groups of people receive an entry permit. People from countries that have been exploited through colonialism, extraction of raw materials and free trade agreements are denied the right to freedom of movement, a perspective in life or simply survival. Their demands for such rights are re-interpreted as an attack on our social security systems, “values” and standards of life. Human rights apparently only apply to a part of humanity. We must no longer live beyond the means of others. All special foreigner laws must be abolished. In the current situation it is not enough to just fight against new failures. There are already tens of thousands of deaths in the Mediterranean, despair in the camps on the Greek islands, trafficking of human beings and torture in the camps in Libya: Not in our name! We will not look away! We will oppose racist policies excluding refugees and migrants; we will oppose the deportation machinery. Migration has always existed and it will continue to exist. We demand that all deportations are stopped and a safe and permanent right to stay for all is established, with full social and political rights. Let us fight together for a world without border regimes, a world which does not focus on profits, but on peoples’ needs, a world without exploitation and racism. Let us begin to create sanctuary cities where there is no division between people with and without the right to stay, where social rights and the right to freedom for all are guaranteed. Join our protest! Let us defend one of the most important basic rights! Let us get involved when self-determination is denied to people in mass camps and when the freedom of the person is interfered with. We are against institutional racism, mass camps and the inhumane deportation system! Our aim is global freedom of movement! Solidarity4all!